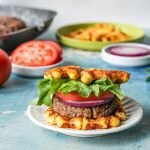 Low Carb Cheese Waffle Burger - A Great Gluten Free Bun! Looking for a fun low carb bun for your burger? 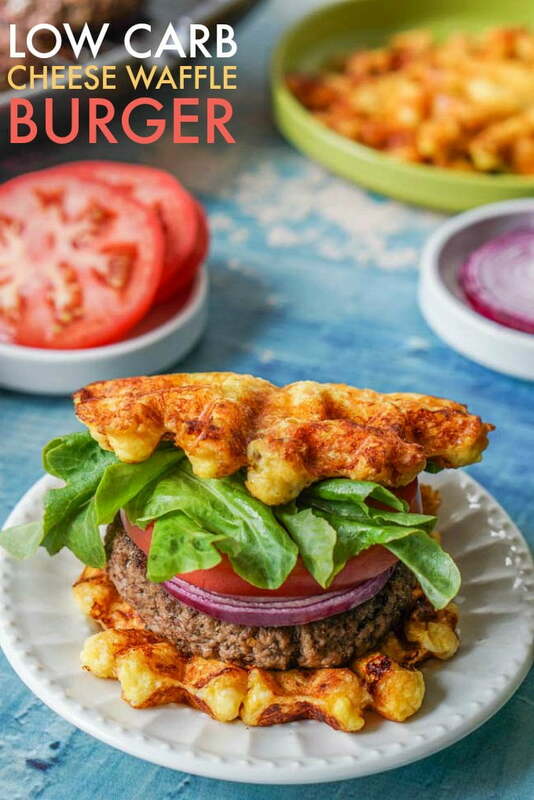 Try a cheese waffle burger! Cheesy, chewy and perfect on your favorite burger. Only 1.6g net carbs for 2 waffles which equals 1 bun. Add your favorite toppings like bacon, peppers, onions, etc. I was watching a cooking show the other day and they were making chicken and waffles. I have never had this dish but it always looks so good. But the whole idea got me to thinking about all of the savory waffles I make. They would make a perfect low carb bun substitute for a burger! They are mostly made out of cheese but they have a chewy texture that tastes bread-like. 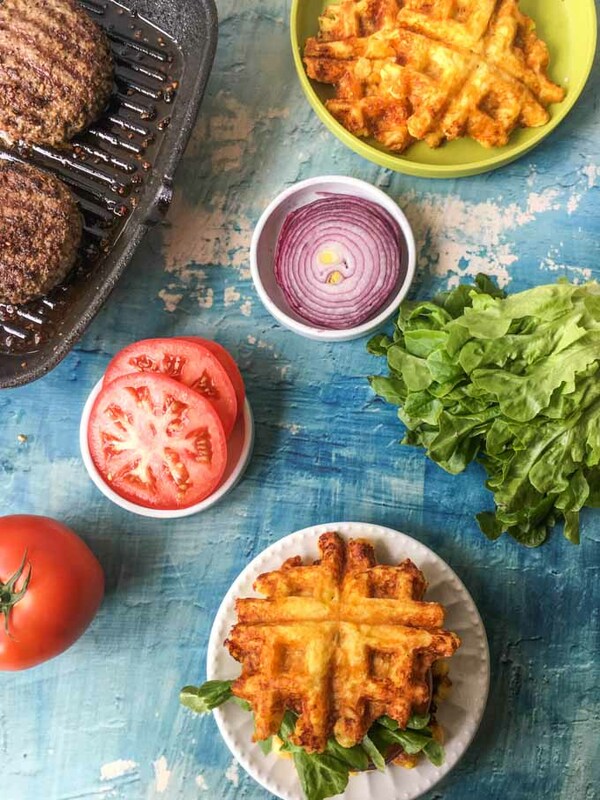 So today I bring you low carb cheese waffle burgers! 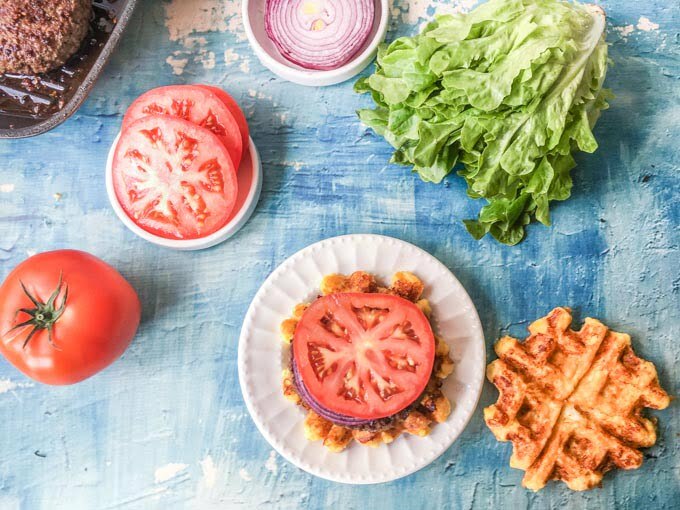 Have you ever tried my savory waffles? I have quite a few recipes on this blog and they seem to be very popular with my readers. My most recent one was a jalapeño popper waffle. Another favorite recently has been my chicken, ham & Swiss waffles. Here are a few more I have on the site. The basic recipe for these savory waffles is riced cauliflower (for bulk), eggs, mozzarella, cheddar and Parmesan cheese. From there you can add in other things like meat, vegetables, spices , etc. You just mix the ingredients together and spoon on to a good waffle maker. We use this one because you don’t have to grease it before using. My hubby makes waffles on the weekend so we get a lot of use out of it and have been very happy with it and it’s very inexpensive. For today’s waffles I just wanted to have a plain cheese waffle so as to add more fresh toppings to my burger. However feel free to add bacon or hot peppers or whatever you want in the batter. You can substitute different cheeses for the cheddar in this recipe but keep the mozzarella and Parmesan. The mozzarella makes it more elastic and the Parmesan acts like breadcrumbs almost. Make sure to keep these waffles small. The bigger you make them the harder they are to get off the waffle iron. Just spoon the batter into the middle to make the smaller ones. Check your waffle maker to see if you should grease it first. You can always use cooking spray to make sure they don’t stick to the waffle iron. These waffles can be frozen. Just pop into the microwave for a 30 seconds or so to reheat. Looking for a low carb bun for your burger? Try a cheese waffle! Cheesy, chewy and perfect on your favorite burger. Make your hamburgers and cook while making the waffles. Preheat the waffle maker. Then in a large bowl, mix the eggs, cauliflower rice and cheeses together. If your waffle maker requires greasing before hand please do so. When waffle maker is hot, spoon a bit of the mixture on the center of the waffle maker and cook according to manufacturers instructions. This recipe should make 6 small waffles which will work as a bun for 3 hamburgers. Hi Kristin, I have not done that but I think it would work fine. Good luck! Just made these. Of course they aren’t “bread”and at first I was disappointed. But as they cooled they were better and will make a great egg and bacon sandwich! Thanks so much! Hi Bev, you are right in that it is not bread but I felt it was a good substitute for bread. I used these alot for sloppy joes and even Philly cheesesteaks. I have yet to try the egg and bacon sandwich but that sounds awesome. Thanks for coming back to comment! Can you use the frozen riced cauliflower for this? Yes but I would thaw it and try to get the moisture out of it. Maybe wrap it in a tea towel and squeeze the water out. But yes you can. Do you cook the cauliflower first? The directions don’t specify. I do not. Thanks for pointing that out. I will update the recipe! Please let me know if you have any other questions and I hope you enjoy it! I love this recipe and can’t wait to try it! No more plain boring burgers for me! I love bread — I could eat it morning, noon, and night. But sometimes a bun gets to be too much when you try to eat a sandwich and all you get it bread. 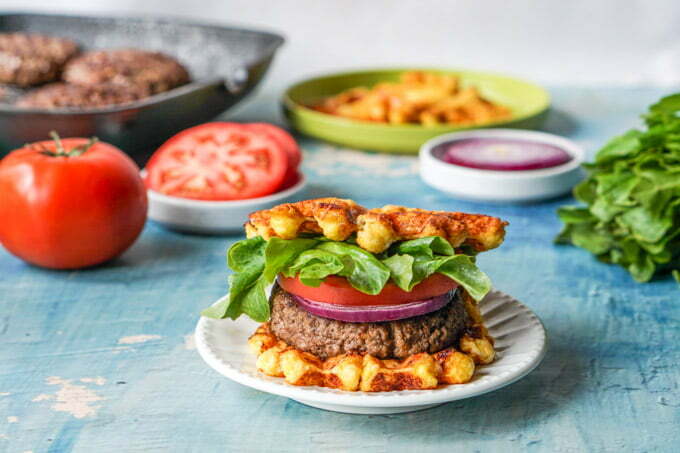 I like the idea of a waffle burger. A nice crunchy holder for your delicious burger. Plus it’s low in carbs — that’s a plus plus!! I love bread too but it doesn’t always love me. Carbs aside I sometimes get headaches from flour so I had to come up with an alternative. Oh this is perfect for me !! I am on a low carb at the moment – too much of summer ice creams. But we are still doing BBQs so this would be perfect for me. I bet the kids will eat it too. They are simple but tasty Veena … and definitely low carb. Well you could just eat them as is and eating them any time of the day! Well the cheese lover in me….LOVES this idea. What a fun idea….and not to mention totally delicious. I might just have to try this tonight for dinner. We are actully having burgers, and I have some cheese that needs to be used up too. It’s really a simple idea but it goes great with burgers. I hope you like it! What a great idea. I would never have thought of using cauliflower to make waffles. This brings low carb and sandwiches to a whole new level. Haha yes it does Patti! So creative! My kids would totally get a kick out of these! Best comment award goes to….drumroll…..Debbie!